If you own an Asus P5B Deluxe or Asus P5B Deluxe/WiFi-AP motherboard which using AMIBIOS, although since BIOS update release version 0910 has built-in support for SLIC table in APCI module, but OEM edition of Windows Vista couldn’t be activated automatically even though with valid OEM product key and Asus OEM certificate. It’s likely due to unmatched OEMID and OEMTableID in the SLIC and RSDT tables of ACPI module with the leaked OEM certificate. So some modification of AMIBIOS in ASUS mobo is needed. A hacker has released a modified version of BIOS for Asus P5B Deluxe and Asus P5B Deluxe/WiFi-AP mobo which self claimed as perfect BIOS for the motherboard based on latest BIOS release version 1004. The perfectly modified v1004 Asus BIOS is extracted from BIOS again by using EZ Flash 2 to backup the modified BIOS that proved to be working, and supports RAID functionality. Warning: Alteration to BIOS may invalidate warranty, cause computer to unable to boot up or other irrecoverable effect. Do it at your own risk. Download the cracked P5B Deluxe Release BIOS 1004 P5BD1004C.ZIP which support SLP 2.0 Vista OEM Activation by using publicly available OEM product key and certificate. Extract P5BD1004C.ROM from the archive and put it on hard disk. Reboot computer and boot into BIOS. Flash the downloaded BIOS into ROM. Install Windows Vista. Do not enter any product key. If you’re already install Windows Vista, skip this step. Download ASUS OEM certificate ASUS.xrm-ms and put it on C:\ root directory. Note: This BIOS must be flashed by using EZ-Flash 2 utility in ASUS BIOS. In future BIOS firmware upgrade, theoretically users can opt to upgrade BIOS from Windows by using ASUS Update V7.09.02 or above, as some of the data including the important SLIC string is static and won’t be replaced by new BIOS. Backup, export or save BIOS of the ASUS P5B-Deluxe or ASUS P5B-Deluxe/WiFi-AP motherboard. You can download the latest BIOS firmware for your motherboard directly from ASUS website too. In this example, assuming the BIOS file saved is named A1004-00.ROM. 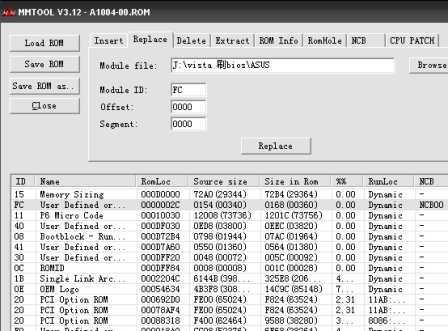 Download and install MMTool v3.12, an AMIBIOS editing tool. Launch MMTool and open or load the BIOS ROM file saved in step 1. In the ID column, locate the module ID of FC. Click on the “Replace” tab. Click on the Browse button, and select the ASUS file that contains byte code to replace the FC section of the BIOS, and then click on Replace button. After replacing the FC section, click on “Save ROM as..” button, and save the replaced BIOS ROM as a file with another name (for example as A.ROM). When computer boots up, press Alt + F2 to access ASUS EZ Flash. Flash (write) the just saved BIOS ROM file (A.ROM) into the BIOS. Restart computer again when done. BIOS will display error or damage when the computer boots up. This shouldn’t cause any problem as only FC module is edited and altered, and not BIOS BOOT module which remains intact. So the error message can be safely ignore. Press F2 to accept default value to boot up to Windows XP. Once log onto Windows XP, use ASUS Update V7.09.02 to flash the original BIOS ROM file that hasn’t been modified (A1004-00.ROM) to repair the BIOS. This flashing will not overwrite the FC module that previously been replaced, so the modification of FC module will remain intact. Reboot system. You may want to set your BIOS configuration and options again. Windows Vista should be activated automatically. Place the modified BIOS file (A.ROM) on the local hard drive. Restart the computer and boot into BIOS. Use the BIOS EZ-Flash utility to flash the A.ROM into ROM. Restart the computer and Load Default to boot into Windows. Use ASUS Update V7.09.02 or above to flash A1004-00.ROM into BIOS. Install Windows Vista, import OEM cert and change to OEM key as mentioned in the remaining steps on Method 2 above. Disclaimer: This article is for information and educational purpose only.